Photo courtesy of Downtown Blackstone, Inc.
From the 1880s to the 1960s, Blackstone was a prominent community in the tobacco market because of its location in the midst of the dark tobacco farming region. Farmers transported tobacco to the marketplace in Blackstone via rail and trucking services, where buyers purchased tobacco to transport to the factories. The booming tobacco market helped establish Blackstone’s status as an important commercial center by the close of the 19th century. Blackstone’s original grid plan dates from 1874. The grid extends from the major intersection of Main and Broad Streets and is still largely intact today. Many commercial buildings were erected in this area during the late 19th and early 20th centuries. This area has undergone a recent revitalization with the restoration of its historic commercial buildings, the reproduction of the town’s early electric street lamps, and the planting of ornamental pear trees along the sidewalks. 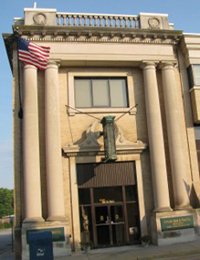 The town’s Federal Revival post office and a rehabilitated Colonial Revival dwelling that now houses the library can also be found in this area. 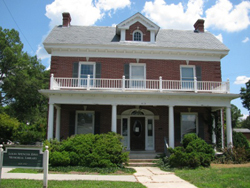 On the south side of the library, stretching from Main Street to Oak Street, is Seay Park, the former site of local businessman Haney H. Seay’s residence. The park is now used for concerts, lectures, and community events throughout the year. The Blackstone Historic District also contains four handsome, architecturally significant churches. Built in 1907, the Blackstone Baptist Church at 403 South Main Street is a fine example of Roman Revival architecture. Crenshaw United Methodist Church at 200 Church Street dates from 1903 and is in the Romanesque Revival style. St. Luke’s Episcopal Church at 420 S. Main Street from 1898 has a well-preserved Carpenter Gothic design interior. The Blackstone Presbyterian Church was constructed in 1901 at 301 Church Street in a more formal version of the Gothic Revival style. Residential areas surround the commercial part of Blackstone’s historic district. Located east of Main Street is Blackstone’s earliest residential neighborhood. The neighborhood contains a variety of Queen Anne and Colonial Revival homes built by 19th century merchants and businessmen who worked in Blackstone. Historic homes in this area include those built by the Dillard brothers at 211 and 305 South High Street, both examples of the Queen Anne style of architecture. Another residential area is on South Main Street between Church and Sixth Streets. This neighborhood contains Queen Anne, Colonial Revival, Bungalow, vernacular Victorian, and Gothic Revival homes and remains largely unchanged. A majority of Blackstone’s historic residential area is within the 16 blocks bordered by South Main Street, Church Street, College Avenue, and Sixth Street. Mostly constructed between 1900 and 1940, these homes are in the Queen Anne, Bungalow, and Colonial Revival architectural styles. Most of Blackstone’s recent construction has occurred outside of the historic district, preserving and protecting the community’s earliest buildings and neighborhoods. The residential neighborhoods of Blackstone were largely segregated until the Civil Rights Acts of the 1960s. The areas north of the commercial district and west of upper Church Street were traditionally black neighborhoods. Less segregation occurred within the commercial district, however. One of Blackstone’s most successful businessmen was Henry L. Jackson, an African American man who owned the brick building at 120 West Broad Street and was granted a liquor license in 1899. He built an elaborate pressed-tin facade on the building and added his name and the date 1901 to cap the building. 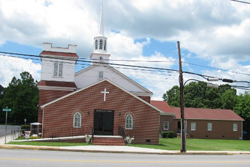 The black Shiloh congregation constructed its church building in 1908 within one block of three of the community’s white churches. The Blackstone Historic District consists of a 16 block area bordered by South Main St., Church St., College Ave., and Sixth St.; and continues on Brunswick Ave. to Ninth St. The Downtown Blackstone, Inc. Main Street Organization is located at 217 N. High St. For more information call 434-292-3041. Tourism information can be found at the Blackstone Chamber of Commerce website, or by calling 434-292-1677. The Town of Blackstone website also contains relevant and helpful information.